Co-Optimus - Video - Co-Op Video Walkthrough: Rival Turf! Co-Op Video Walkthrough: Rival Turf! Beat-'em-ups ruled arcades in the early '90s, and unfortunately, the 16-bit Super NES was incapable of bringing the arcade experience home at launch. Capcom's Final Fight hit the SNES in 1991 with a large chunk of its arcade content removed, and worst of all, it lost its two-player co-op mode - a key feature that drove the genre's rising popularity. 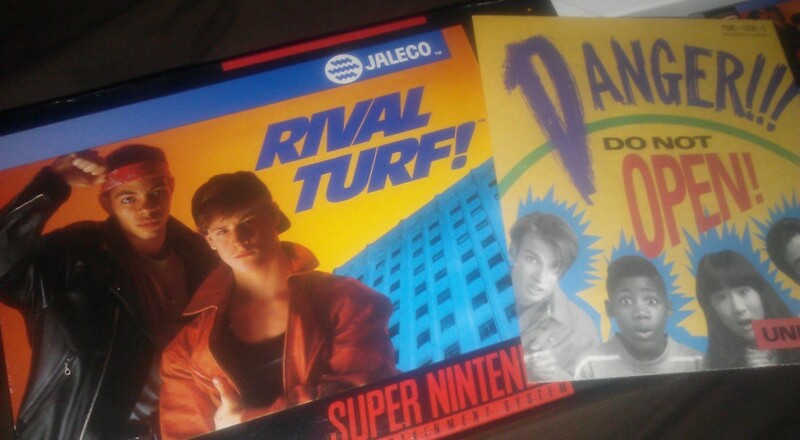 Japanese publisher Jaleco, sensing a unfilled niche in the 16-bit marketplace, swooped in soon after with Rival Turf!, a Final Fight-styled brawler that lacked much of its inspiration's charm and depth, but made up for its deficiencies with a solid two-player co-op mode. Rival Turf also included the single greatest feature to ever grace a brawler on any platform. Last week, my partner Alex and I demonstrated this odd little inclusion via the Co-Optimus Twitch channel. You can see an archive of our playthrough below. To access this feature, earn a high score in the game's single-player mode and enter your name as "CHRCONF". You'll then be able to rename every single character in the game - an amazing feature that makes Rival Turf! way more fun than it would be otherwise. During our journey to the embattled box factories of Mexico, we take advantage of this code to fight armies of Randos, Jerks, and humanoid personifications of the worst portable console of them all - the Nokia N-Gage. Please enjoy. Page created in 1.3736 seconds.